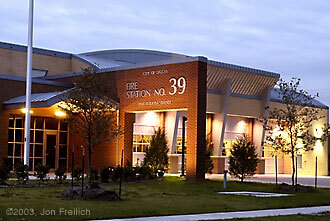 Nov. 14, 2003 - Fire station number 39 glows in the late evening light of an overcast November day. The station is the department's newest and has only been in service a few months. An engine, truck and boat are stationed there. ©1996-2004, Freilich Creative Services. All Rights Reserved.